Just ridiculous. These employment reports from the Bureau of Labor Statistics are simply laughable. What's unfortunate is that policymakers in Washington base all sorts of decisions off them. The DJIA is off a bit today, as the BLS reports the economy shed 85,000 jobs in December. Yet the unemployment rate held steady at 10%. 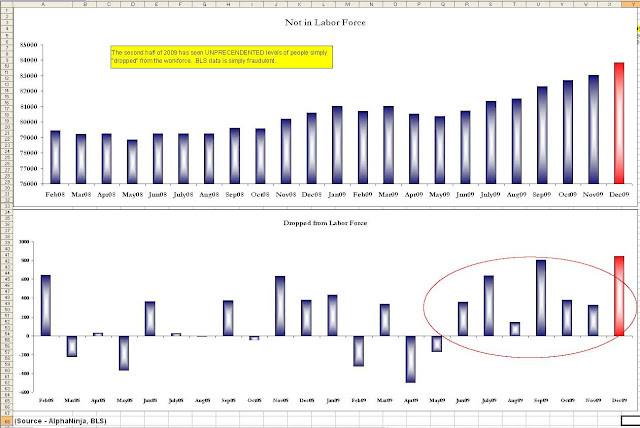 I've updated my charts of those "not in the labor force" and the monthly totals of those dropped from the labor force. December, the 843k dropped from the labor force capped off a ridiculous second half of 2009, in terms of people "dropped" from the denominator of the unemployment equation to make the picture rosier than it really is.